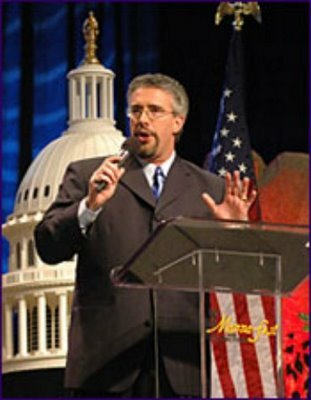 In 1996 perry stone had a vision from the Lord of a warning of a future terrorist attack upon America and 5 tornadoes to hit the economy after this event. This has been proven to be the 9/11 attacks that was targeted against the financial centers of the United States. The vision was received in June 1996 5 years before 9/11 2001. In the vision he was walking up a paved road that went up a hill. He saw homes to the side that was filled with retired ministers and he was stopped by a concrete wall. When he climbed over the wall he saw a beautiful field of corn growing far into the distance. At the end of the field there stood a dark tower covered by a dark cloud and at its base there ran across old fashion power lines. and at the center of the field lay a water cistern filed with water. From the clear sky there descended 5 grey tornadoes to the edge of the field. 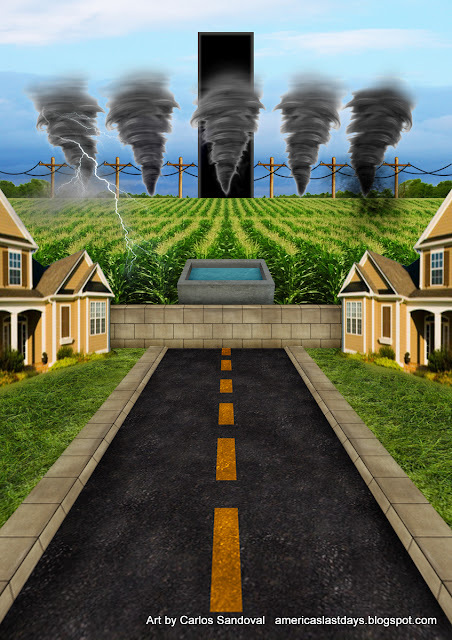 Then the first tornado ripped a row of corn by the roots and left the land bear up to the wall and the 2nd, the 3rd, the 4th, and the 5th took there turn to destroy a row of corn. This left the entire field behind the wall completely bear. The vision was a 5 year warning of the 9/11 attacks in 2001 against the financial center of america. 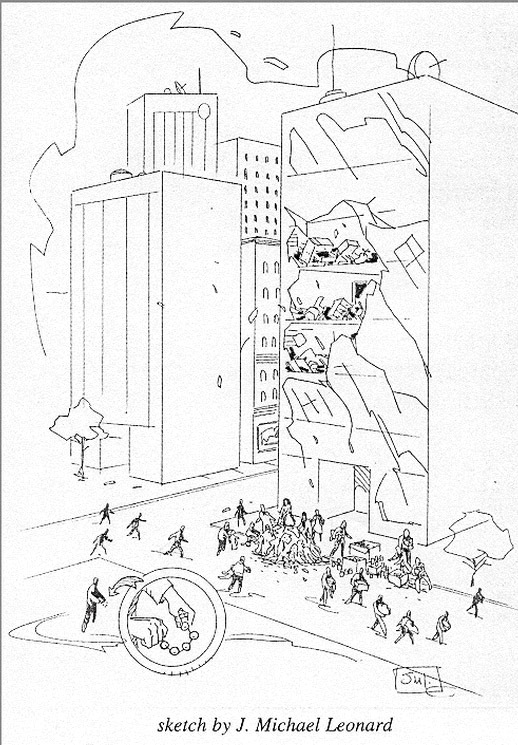 The wall and the street in the vision represents a symbolic picture of wall street. The field of corn represents the vast amounts of wealth in the stock market that will be stolen by 5 events to hit the nation over a period of time. There are two symbolic homes filled with retired ministers representing the older generation ready to retire. This gives a hidden warning to the people and their 401k's to be stolen in the stock market by 5 terrible events represented by 5 tornadoes. 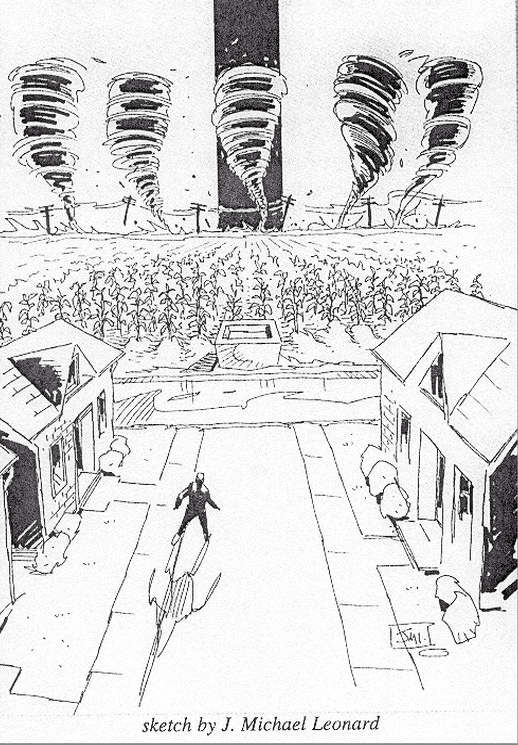 The 5 tornadoes represented 5 years from 1996 in 2001 and a warning of 9/11 by the black tower. The 5 tornadoes also represent 5 terrible event to effect the economy over a period of 10 years because of the 5 tornadoes in this double vision. The water cistern hit by the 3rd tornado represents a terrible event to hit the nation that has been seen to be hurricane Katrina. The 5 events represented by the 5 tornadoes were 9/11, Iraq War, hurricane Katrina, 2008 recession, (gulf oil spill and middle east oil crisis). This was a warning of the economic crisis that has loomed over america for the past 10 years and will lead to the economic devaluation of the dollar in the years to come. This is one more step to the financial collapse of america. The 1st calamity was the 9/11 attacks on the United States financial system. The 2nd calamity was the Iraq war and the cost of that war. The 4th calamity was the 2007 2008 mortgage crisis which has caused Trillions of dollars to be added to the national debt, joblessness and a national recession that continues to this day and will lead to the economic collapse of america. The 5th calamity was the gulf oil spill which hurt the economy in the south and stopped the United States plan to free itself from foreign oil by offshore drilling. The story begins several years ago on a Sunday afternoon. That morning, I had ministered at the Brooksville Assembly of God in Brooksville, Florida. Don Channell and I were staying in the home of a church couple. That afternoon, I felt exhausted and told Don, "I must rest before church". I went to a private bedroom, opened my Bible to read and became very drowsy. I closed the Bible and lay across the bed with my face down on my Bible. Within a matter of minutes, by the Spirit of God, I was experiencing a full color vision . Oddly enough, I knew I was having a vision. I knew I was in Brooksville lying on a bed, yet I was seeing a perfectly clear picture unfold before my eyes. I was literally part of the scene. In the vision, I saw a straight paved road that led to the top of a hill . On either side of the road were small brick homes. For some reason I felt they were homes of retired ministers . I began walking up the hill, stepping on a sidewalk on the left side of the road . It was then that I noticed I was barefoot. As I continued up the hill, I noticed two strange sights. At the top was a large concrete barrier , like a wall . I knew something was behind this barrier. I also noticed the sky was perfectly blue, except for one dark pillar of black (a cloud) that resembled a black tower reaching from heaven to earth. It was hitting the earth somewhere behind the barrier. I thought, "How strange! Everything looks great, but this one dark cloud is coming from heaven to earth ". I decided to go to the top of the hill and investigate the scene. After reaching the top, I climbed up on the concrete wall. To my amazement, a beautiful corn field was behind the barrier . As far as I could see to the left and right, the field stretched, filled with the most beautiful ripe corn I had ever seen . The rows were close together and the corn was ready for harvest. I could see the golden tassels on top of the stalk. In the distance, the scene was much different. At the far edge of the field I saw five large tornado's . They each were the same size and seemed to be spaced equally . 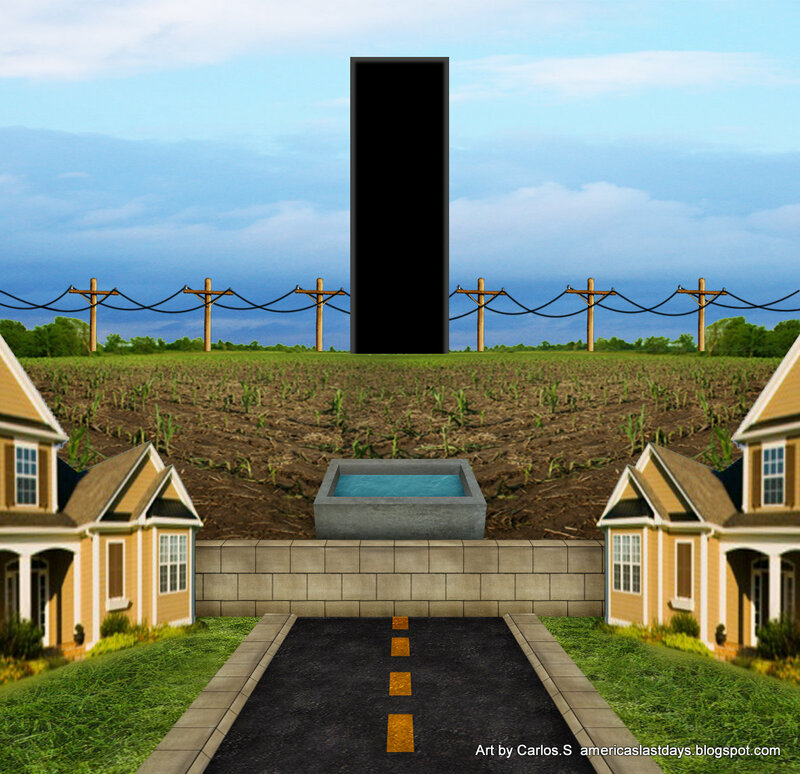 To me, it seemed they were coming out of this large dark pillar . As I observed the five Tornado's, I recall seeing old fashioned power lines directly behind the tornado's . Suddenly, the tornado on the left began to spin . I could hear a whooshing sound as it slowly began to gain speed. Then I saw sparks, similar to bits of lightning, coming from the first tornado. That is when I knew what was going to happen. 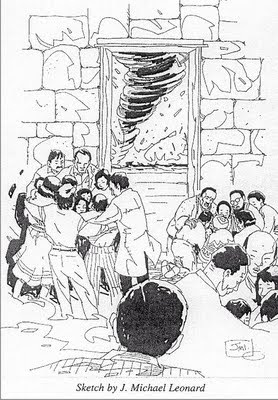 I sensed that soon , the first tornado would rip through the corn field and take out a row of precious grain . By the time this tornado would reach the barrier, the second would rip a row of grain out, followed by a third, a forth, and finally the fifth tornado. I knew that when the fifth tornado hit , it would conclude this strange storm . 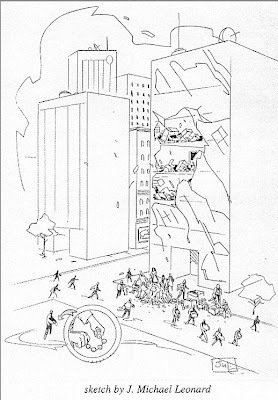 I recall jumping off the concrete barrier, running down the hill and shouting, "I must get into the cleft of the rock. The storms are coming , and I must get into the cleft of the rock !" Suddenly, I came to myself. My heart was pounding and my spirit was weeping. I jumped off the bed and knocked on the door of Don Channell. I began telling him about the vision. Don and I were not certain of the meaning, but the vision has stayed with me for the last three years. 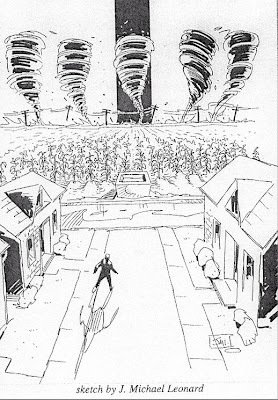 About six months later I had a night dream that I believed to be related to the vision of the five tornado's. In the dream, I was standing in the inner city of some great metropolis and heard people saying, " The storm is coming . We must find shelter and protection ". I led the people into the basement of a large, old church . The church building was built from the large granite blocks that many of the historic downtown churches are made of. I saw people from various ethnic groups - Black, Hispanic and Asian. People were huddled together with their particular ethnic group . They were all frightened and cold, holding on to each other. Great fear gripped each person . Suddenly, a huge tornado hit the building. The church began to shake, but did not collapse. I noticed there was no doors in the church (because Jesus is the door). I could see these large tornado's, five in all, as each one roared by and struck the church . I could hear the pounding of rain and hail as it beat against the outside of the building. After the fifth tornado passed by, there was a calm. Everyone went outside to inspect the damage. As we left the church basement , I saw several piles of different items . Some piles contained canned food. Others contained clothing. There were even piles of small toys for children. Some of the people began to run for cans of food, while several others rummaged through the clothes and still others were seeking a toy for their small child. It is what I saw at that moment that confounded and amazed me. As the scene changed, I could clearly see the skyline of a large city, complete with tall skyscrapers. I looked for structural damage and found that the damage was not to the exterior of the buildings , but to the inside of the buildings instead. Still, not every building was affected. Some looked perfectly normal. Others seemed to have taken a harder hit. In one glass building, I noticed that the file cabinets were opened and papers were all over the floor. It seemed confusion had hit this office . Yet, two other buildings across from this damaged building appeared to have come through the storm without any major damage .